The didacta is Europe’s largest educational fair and shows what direction the future of learning is going – from early childhood to adult education. Have an espresso at the Goethe-Institut’s stand. Crowds of people drift through the aisles of the Stuttgart trade fair buildings. The largest educational fair in Europe is certainly well attended. The Didacta, the “catwalk” of all education providers, is highly important because education is an essential fuel in a highly diversified society. More than ever, everyone not only is in constant need of learning and further education, they look forward to it as well. In this respect, the fair is also an important forum for the Goethe-Institut. 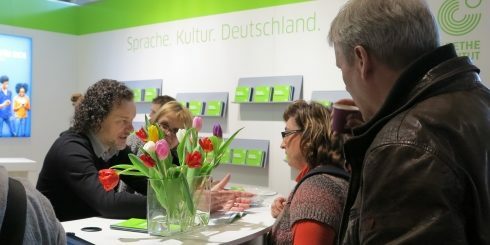 The Goethe-Institut is among the many exhibitors with stands at Europe’s largest education trade fair in Stuttgart. | Photo: Jennifer Weißenberger The Didacta is taking place in Stuttgart from 14 to 18 February. Every day on the fair grounds by the Neckar, the Goethe-Institut is providing information about its further education and advanced training programmes. Presentations, talks with experts, trial lessons and personal conversations at the espresso bar offer insights into its diversity: whether regional studies, methodology and didactics or for expanding language skills. This year the main focus is on German as a foreign language and early childhood German learning. At the stand, topics such as further education programmes for lateral entrants or intercultural further education courses are discussed in a variety of formats. | Photo: Jennifer Weißenberger On site, staff members from the language department manage the trade fair stand amid lively comings and goings. One group of visitors is sitting on colourful “Goethe seat cubes” raptly watching the big screen TV. It is showing a video about the early learning project Deutsch mit Socke. A few metres away between bouquets of tulips, an educator is finding out about German learning programmes for refugees. Meanwhile two students enjoying cups of espresso take delight in the little buttons printed with popular German words like “Quatsch”, “Brot” and “Liebe.” By all means, the didacta offers plenty of opportunities for anyone with a love of language and learning.